As a economics major in college, I have always been fascinated by using incentives to influence a person’s or group’s behavior. For years, I have been concerned about the skyrocketing rate of injuries among young baseball pitchers due to year-round pitching and early sport specialization. In my latest newspaper column, I discuss how Major League Baseball could influence high school pitchers to stop trying to throw as hard as they can. In doing so, they can prevent a huge number of elbow and shoulder surgeries and increase the chances these kids actually pitch in the majors one day. High school baseball has a problem. Because of it, Major League Baseball has an even bigger problem. High school pitchers are throwing harder than ever – and more often than ever. That trend is hurting the young athletes – literally. You’ve heard me discuss this problem in previous columns. Here’s what I haven’t mentioned. This trend of high school kids throwing 90+ mph is destroying big league clubs, their pitching staffs, and their chances of winning World Series titles. Why? As Sports Illustrated’s Tom Verducci demonstrated in a recent article, MLB teams spent the last decade wasting first-round draft picks on high school pitchers who throw harder than major leaguers. Between 2011 and 2014, major league clubs selected 47 high school pitchers in the first round of the MLB Draft. Over half – 24 of the 47 – never reached the majors. Almost half – 40 percent – underwent shoulder or elbow surgery. Only 17 percent are pitching in the major leagues with the team that drafted them, and 13 percent are no longer pitching in affiliated baseball. Quite frankly, if your team uses a first-round pick on a high school pitcher, it’s almost as likely that kid is out of baseball within a few years as he is to be pitching in your rotation. What’s the driving force behind this overwhelming failure? The radar gun. 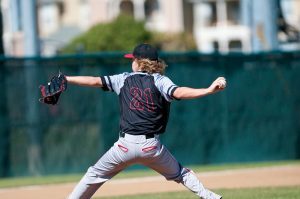 Pitching velocity drives youth and high school baseball. College coaches and scouts love velocity, leading more kids to try to throw as hard as they can. The average MLB fastball travels 93 mph. Over the last eight years, major league teams selected 40 high school pitchers in the first round. Those 40 pitchers averaged 95.1 mph. Only two of the 40 threw under 93 mph. Parents and coaches push harder than ever to get young hurlers to throw that hard. They subject kids to the same training programs big league pitchers use. But kids’ bodies are still growing and cannot handle the physical stress that velocity creates. Add in the fact that some of these kids pitch in leagues and showcases year-round – 78 percent of the high school pitchers recently picked in the first round lived in warm-weather states – and it’s no surprise they are breaking down. Looking at high school pitchers taken in the first round between 2011 and 2017, over one-third (23 of 66) suffered an injury that required shoulder or elbow surgery. Those 23 pitchers averaged 94.3 mph in high school. There are only 23 pitchers total in the majors throwing that hard. Now look at which pitchers are successful in the majors. Of the five top candidates in each league for the Cy Young award last season, nine of the ten entered pro baseball out of college, not high school. The only high schooler out of that group – Blake Snell of the Tampa Bay Rays, only reached 90 mph in high school. He has since added 15 pounds, and now his fastball averages 96 mph. I interviewed pitching biomechanics expert Glenn Fleisig, Ph.D., of the American Sports Medicine Institute for my book That’s Gotta Hurt. He argued that the only way we will convince parents and coaches to stop pushing kids to specialize in baseball and pitching year-round at an early age would be for major league teams to stop drafting kids who do it. Then early sport specialization and year-round pitching would stop quickly. I’m confident this “throw as hard as you can” phenomenon will go away. I met Oakland A’s general manager and Moneyball subject Billy Beane at a conference a few years ago. While it’s well known that teams use complex statistical analysis to predict on-field performance, he said that teams are quietly tracking injuries. They want to better predict which players will get injured, how long they would be out, and what effect those injuries would have on their post-injury productivity. MLB teams will soon stop wasting high draft picks and millions of dollars on high school pitchers. Without the promise of first-round selections in high school, parents and coaches would be wise to stop pushing their kids to throw so hard. For all the high school pitchers out there, consider this message. Drop the radar gun and stop trying to break 90 on your fastball. Go to college. Let your body develop and grow into your pitching. Maybe then you’ll have a real shot at being a major league pitcher. Note: A modified version of this article appears as my sports medicine column in the February 15, 2019 issue of The Post and Courier. MLB Draft: High school pitchers a bad choice in baseball. By Tom Verducci. SI.com. November 19, 2018.